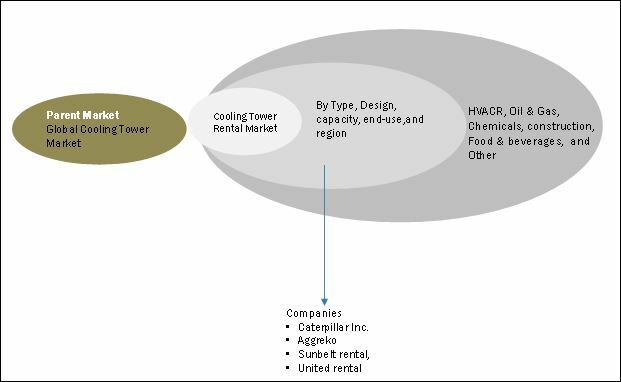 [145 Pages Report] The cooling tower rental market is estimated to be USD 0.77 Billion in 2017 and is expected to grow at a CAGR of 5.18% from 2017 to 2022 to reach the market size of USD 0.99 Billion by 2022. This growth can be attributed to the increased demand for power generation. To define, describe, and forecast the market by design, by capacity, by type, and region. This research study involved the use of extensive secondary sources, directories, and databases, such as Hoover’s, Bloomberg Businessweek, Factiva, and OneSource, to identify and collect information useful for a technical, market-oriented, and commercial study of the market. Primary sources are mainly industry experts from core and related industries, preferred suppliers, manufacturers, distributors, service providers, technology developers, standards and certification organizations of companies, and organizations related to all the segments of this industry’s value chain. The research methodology has been explained below. After arriving at the overall market size, the total market has been split into segments and subsegments. The figure given above illustrates the breakdown of primaries conducted during the research study on the basis of company type, designation, and region. The ecosystem of cooling tower rental market starts with the parent cooling tower rental market which is further categorized, by capacity, into up to 500 tons, 500 to 1000 tons, 1000 to 1500 tons, 1500–3000 tons, and above 3000 tons The market is segmented, by design into mechanical draft, natural draft which includes biogas, landfill gas & sewage gas, and others, which includes producer gas, coal mine gas, wood gas, and propane gas. It has been further categorized into end-use type, into power generation and mechanical drive. The cooling tower rental market has been segmented as follows. The global cooling tower rental market is expected to grow at a CAGR of 5.18%, from 2017 to 2022, to reach a projected USD 0.99 Billion by 2022. The growth will be mainly driven by rise in HVACR deployments and growth in industrial activities across globe. The report segments the cooling towers rental market, on the basis of type, into wet, dry and hybrid. The wet segment led the cooling towers rental market in 2015. Wet cooling tower rental services are largely consumed for power generation by utilities and manufacturing facilities apart from other applications. Dry cooling tower rental market is expected to grow most swiftly during the forecast period (2017 to 2022) mainly due to the increasing implementation of energy efficiency targets globally and growth of HVACR applications in the expanding commercial building and construction industry. Global cooling tower rental market, by design, is segmented into mechanical draft and natural draft of which Mechanical is the fastest growing segment. Manufacturing plants, commercial buildings, public buildings, and utilities mainly utilize cooling tower rentals for power generation application. Growing demand for global power requirement, especially in regions such as Europe, North America and Asia Pacific is contributing the demand growth for Mechanical draft cooling tower rentals. The report further segments cooling towers rental market, by capacity which include up to 500 tons, 500-1,000 tons, 1,000-1,500 tons, 1,500-3,000 tons and above 3000 tons. The 1,000-1,500 ton capacity range cooling tower rental are expected to grow at the highest CAGR in the forecast period. This capacity range cooling towers are mostly rented for commercial, industrial or manufacturing facilities, indoor and outdoor applications, and high-temperature applications. In terms of end-use, industrial segment hold the largest market share in the cooling tower rental market. The industrial end-use segment has been further segmented into oil & gas, chemicals and petrochemicals, construction, food and beverage, metal & mining and utilities. Some of the processes and industries that use rental cooling include chemical, ethanol production, metals, mining, oil refining, textiles and steel production. Cooling towers play a significant role in various industries as they help overcome the issues of overheating of plants. Overheating may cause fire mishaps, breakdown of plants, and damage to machines. Cooling towers dissipate heat into the atmosphere through diffusion to prevent these concerns. Therefore, petroleum refineries, natural gas processing plants, petrochemical and chemical plants, nuclear power plants, and fossil-fuel power plants install these towers to prevent risks of accidents caused by overheating. North America is projected to be the largest market for cooling tower rental due to its stringent environmental norms and increasing investments in major industries such as oil & gas, power utilities, metals and mining. This market is also expected to boost global cooling tower rental market during the forecast period. The major factor restraining the growth of the cooling tower rental market is that it’s nature of being highly fragmented and stiff competition. 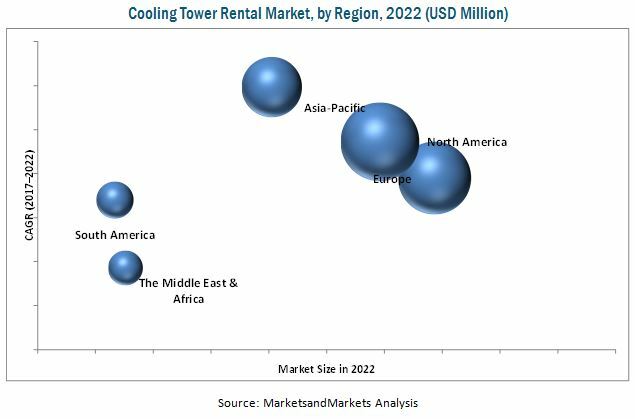 Some of the global players in this market include Aggreko, United rental, Sunbelt Rental, Caterpillar, Johnson Controls, Engie Refrigeration, together they hold a strong share of the global cooling tower rental market.